North, but as soon as Ed heard about it he tossed his hat into the ring. Funny that. I’m going to start by reading a few telegrams from people who couldn’t be here today. [Reading]: "Dear Ed, Thanks for your kind invitation, but I’d rather stick pins in my eyes." [Looking up]: That’s from my wife, Louise. [Reading]: "Dear Ed, I’m happy to pick up the tab. You can pay me back when you get to Number 10." [Looking up]: That’s from Brendan Barber, the General Secretary of the TUC. [Reading]: "Dear Ed, Congratulations. You remind me of myself more and more each day." [Looking up]: That one’s from Neil Kinnock. later, he was speaking human. He’s still not quite fluent, but we’re hoping he’ll master it within the next four years. dressed alike. I remember one occasion when the school bully came up to him and said, "Ed, I’m going to punch you really, really hard on the nose." He said, "I’m not Ed, I’m David. That’s Ed over there." [Rubbing nose]: I can still feel that punch to this day. Justine once asked if Ed was a competitive person. "I’m not sure I’d use that word," I said. "What word would you use?" "Fratricidal." when they were teenagers and, a week later, only Ed came back. He refuses to talk about it to this day. It could be worse. At least he hasn’t slept with my wife. She turned him down, thank God. [Raises glass]: Ladies and gentlemen, the bridesmaids. 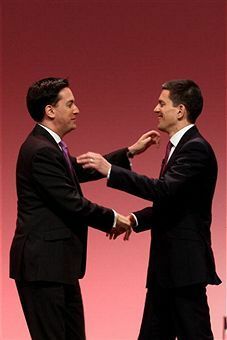 The speech that David Miliband would have given on Saturday?